In The Goodtime Girl, Tess Fragoulis spins a tale set in the 1920s featuring Kivelli Fotiathi, the daughter of a wealthy family living in Smyrna, now part of Turkey. Determined to decide her own destiny, Kivelli turns down a number of wealthy suitors introduced by her father, but her life is torn asunder when the Turks seize control of Smyrna and set the town ablaze. Kivelli’s life mirrors the fate of many Greeks who survived the Great Fire of Smyrna in 1922, later finding themselves penniless refugees and largely unwanted by Greek mainlanders. The options available to a young unmarried woman are limited, and Kivelli finds herself cleaning a brothel for a madam in Piraeus, an Athens slum. When it is revealed she can sing, she becomes a performer for hashish-smoking manghes (gangsters) in a local tavern. Her modest income allows Kivelli to repay the madam and buy her freedom, but life in the underworld is difficult to negotiate for anyone, let alone a young woman. Kivella sings rembetiko or the Greek blues, the music of a subculture, with themes of drink, drugs, crime, prostitution and violence. A native of Crete, Fragoulis has said that the story came to her when she heard rembetiko on the radio for the first time. Initially the music of the underclass, rembetiko later gained popularity among the working and lower middle classes. Kivelli’s talent unexpectedly opens doors for the singer, and soon she finds herself recording songs written by Marianthi, a songwriter who becomes both Kivelli’s friend and rival. Just as her fortunes change, Kivelli meets a handsome bad boy and ends up in a love triangle, realistically rendered by Fragoulis. Knowledge of the Great Fire of Smyrna is key to understanding the order of the book. While the mention of Smyrna and the 1920s will be enough for some readers to understand the sequence of events, a few may be confused by Kivelli’s sudden change in social standing, from her wealthy life in Smyrna in one chapter to subsisting in a brothel in Piraeus in the next. Although Kivelli’s resolve to forget her past is consistent throughout the book, her ability to suppress all thoughts of the tragedy until chapter 24 borders on the superhuman. But this is a minor point. The focus of the story is not her dramatic fall in status, but her survival as a singer in a drug-infested underworld where there is no room for weakness. Although there was a lack of closure among the characters at the end, The Goodtime Girl is a satisfying read. There’s a beautiful film noir feel to this tale, and it comes with a welcome twist: the story is seen through the eyes of a strong woman, an entertainer, and the only woman apart from prostitutes allowed into this sleazy world. Her observations in no way aggrandize the murderers and thugs in her presence, but paint them exactly as they are, with all their strengths and vulnerabilities. If you can’t afford a trip to Greece this summer, The Goodtime Girl is the next best thing. Escape guaranteed. This review was cross-posted at Rover Arts Uncovered. 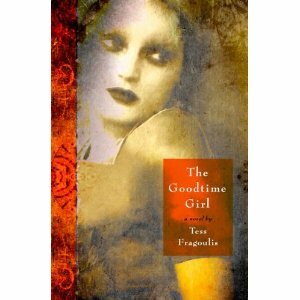 : Summer Reads: The Goodtime Girl by Tess FragoulisTweet this!